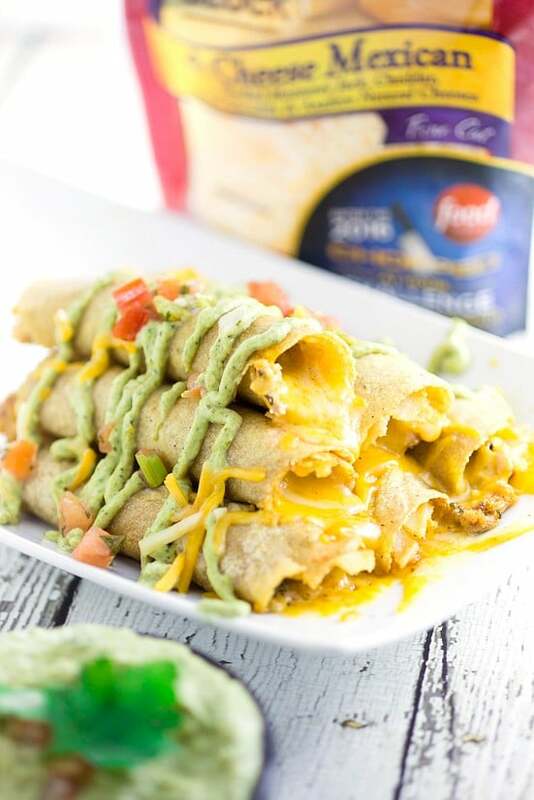 Easy and cheesy Baked Chicken Taquitos will become a yummy, Mexican-inspired family dinner favorite in no time! Serve with the Roasted Creamy Poblano Dip for an extra zesty and a little spicy kick. Okay, I’m trying to control my excitement about this recipe, but it’s just so hard! Do you watch the show Chopped on Food Network? If you don’t, you need to check it out ASAP. It’s so much fun watching the chefs try to come up with something edible and delicious with a mod podge of ingredients, some which, I’ll admit, I’ve never even heard of, let alone tried to cook with! 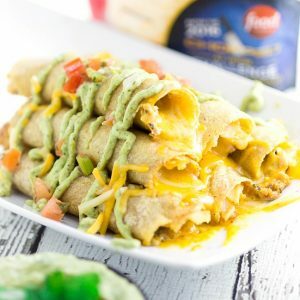 Anyway, the reason I’m so excited is because I got to make this Cheesy Baked Chicken Taquitos recipe with Creamy Roasted Poblano Dip for the Chopped at Home Challenge with Sargento®. 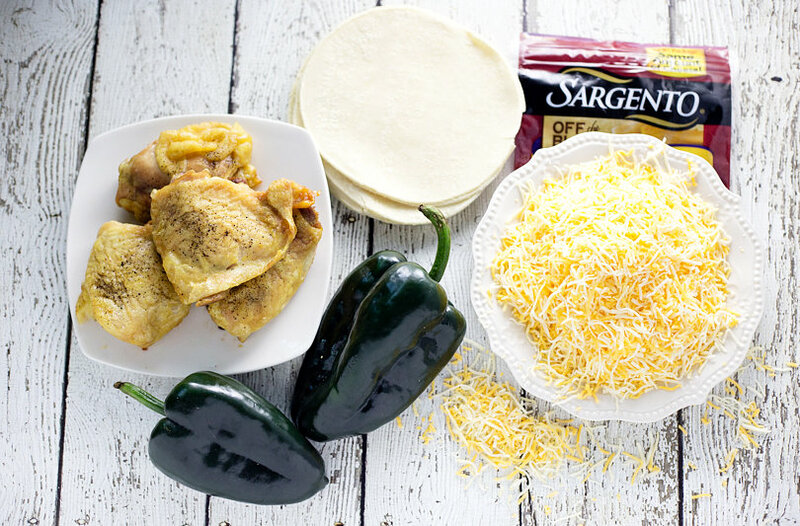 As you know, my motto is, “Everything is better with cheese!” So I’m sure you’re not surprised to find out that I created a super cheesy recipe, and that I’m absolutely thrilled to partner with Sargento. 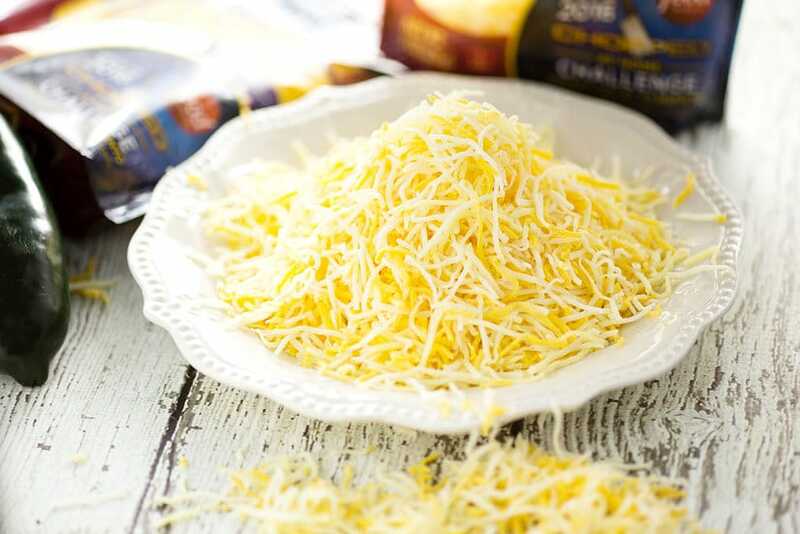 After all, Sargento Shredded Cheese is 100% real, natural, creamy, delicious cheese that’s grated, sliced or cut right off the block! It comes in 30 different varieties, blends, and cuts (ranging in size from 3.25 to 3.95 ounces) for a suggested retail price of just $2.69. Now let me be honest with you. Those corn tortillas gave me some real grief during this challenge. First, I had a hard time coming up with a recipe that used them. I don’t like to use them too much because they’re kind of hard to work with unless they’re fresh. Despite my better judgment, I decided to go ahead and use store-bought corn tortillas, and my taquitos exploded! (Definitely would have gotten booted if I was in the real Chopped kitchen). Sigh. So I made the recipe again using fresh, homemade corn tortillas, and it turned out fabulous. Like super fabulous. I couldn’t stop eating them. The kids couldn’t stop eating them. Amazing. 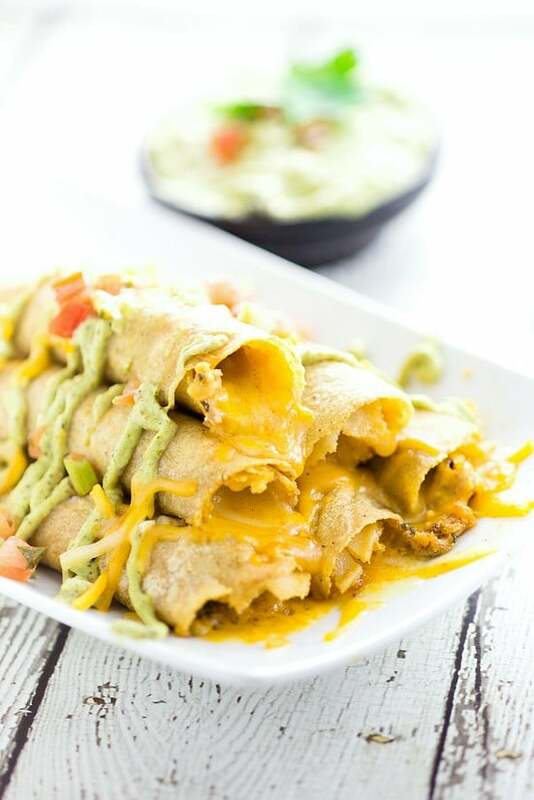 They were cheesy, crunchy, and everything you’d hope for in your favorite recipe for taquitos. (If you’re making these at home, I strongly advise using fresh homemade corn tortillas or subbing them for 6-inch flour tortillas.) And the Creamy Roasted Poblano Dip added even more zesty, sweet, and spicy flavor. After we ran out of taquitos, I started eating it with chips! In a large bowl, place chicken, cheese, sour cream, salsa, cilantro, and spices. Stir until combined. Scoop 2-3 tablespoons of taquito filling onto a tortilla Then roll into a taquito, and place on a large baking sheet. Bake in a 400 degree F oven for 10-20 minutes, until they get slight crispy and cooked through. 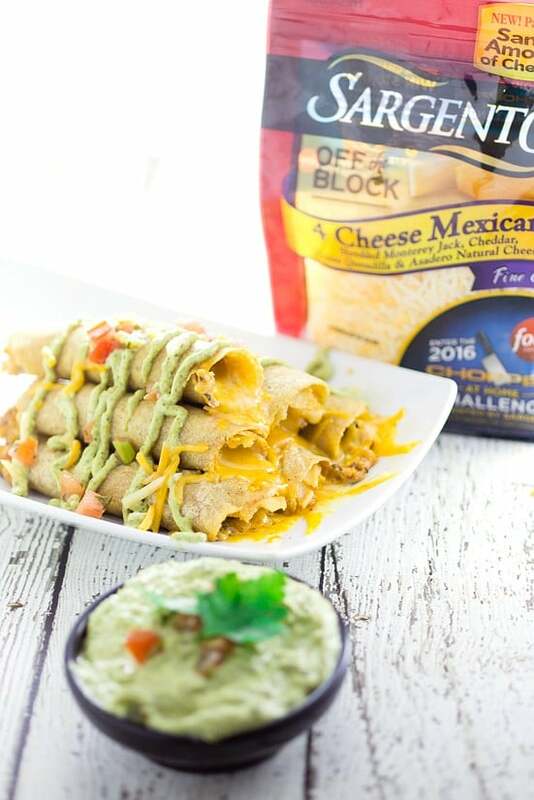 Serve cheesy baked chicken taquitos warm with fresh creamy roasted poblano dip. 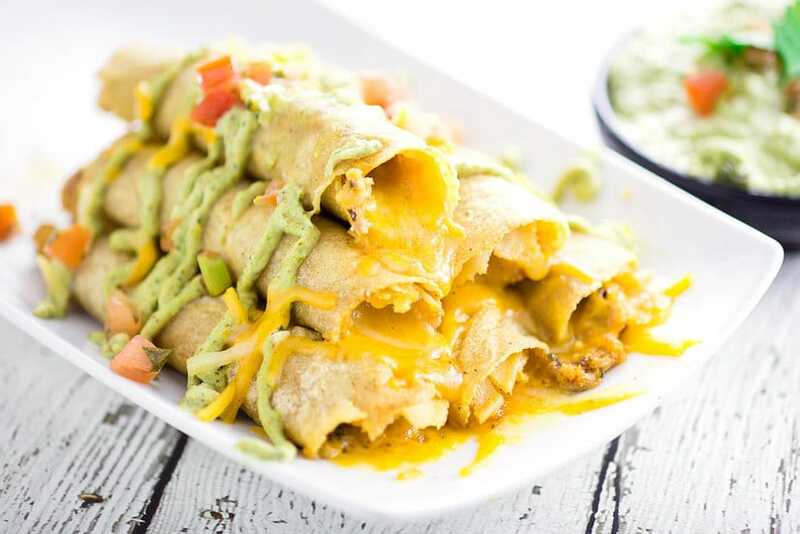 Serve these Cheesy Chicken Taquitos with this zesty creamy roasted poblano sauce. For more inspiration, check out the Sargento Pinterest page or visit www.sargento.com/Shredded for more information. craving mexican right now after seeing this post! love the photos. These look fantastic! Thanks for linking up with What’s Cookin’ Wednesday!